Power, poetry and passion, three words that describe Rebekka on stage. Gracefully climbing a rope various times and in different ways requires an almost superhuman strength, something an Aerial Rope, Silk & Trapeze performer like her can showcase in the most beautiful way. An immense amount of passion is shown from Rebekka as you can see how much she loves being on the stage and in the air. With Rebekka you will see the most spectacular twists and flips and acrobatic movements high above the ground, showing unimaginable moves. 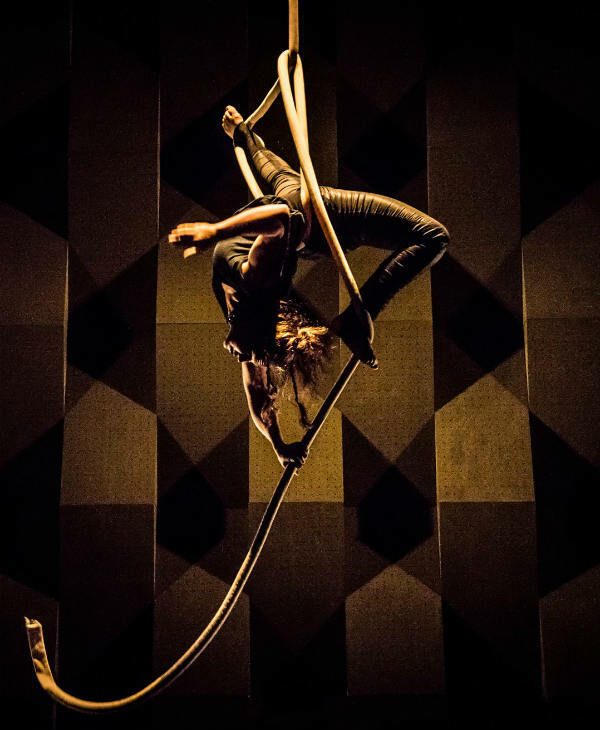 Enjoy the rush of adrenaline whilst Rebekka twists and flips during her performance. 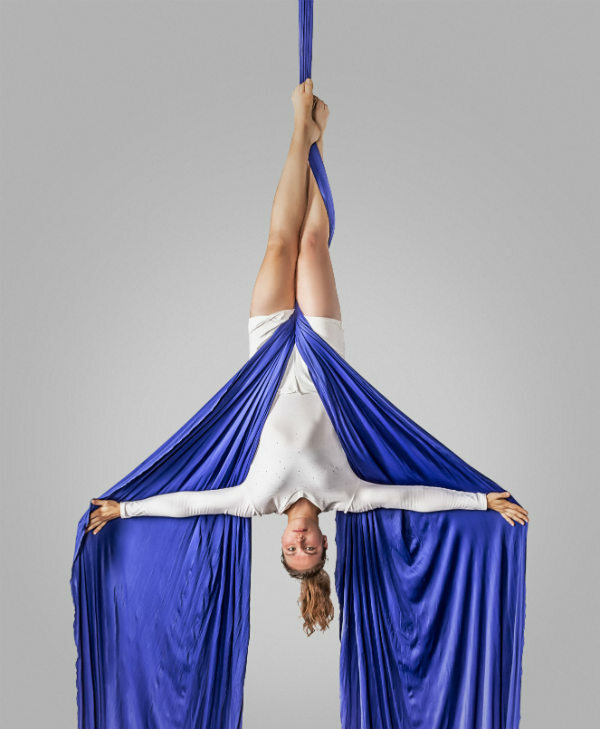 This Aerial Rope, Silk & Trapeze performer has been training for many years and has performed her act in many different venues from circus tents, restaurants, on stages with varying heights, even outdoor and above water! 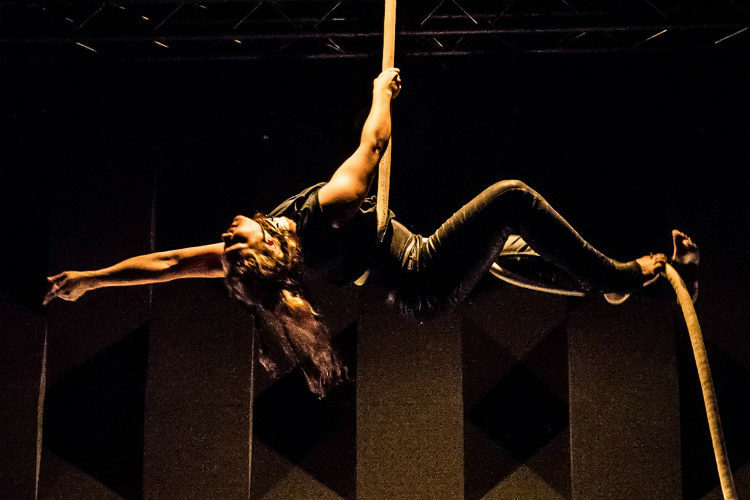 Rebekka has worked as an Aerial Rope, Silk & Trapeze performer in a traditional circus, also playing in modern circus style shows – Rebekka knows how to adapt her act to the style of each venue. Being a creative Aerial Rope, Silk & Trapeze performer, she also enjoys choreographing a unique special piece for individual events. Everything is possible – from Rock’n’Roll to romance! Rebekka’s latest aerial performance “Whitespace” is a milestone for her career. It combines fluid dance movements with some of the most difficult acrobatic tricks. At one point of the performance she let’s go of the rope, performs a salto drop and catches the rope again – a movement that requires a lot of strength, courage and precision. In 2018 her rope act has been nominated for the Premi Zirkolika in the category “best act”. While aerial rope is the focus of the incredible Aerial Rope, Silk & Trapeze performer Rebekka, guests are captivated by the sheer beauty of the aerial silks. The colourful ribbons fly in the air whilst the artist performs with them. Seeing the way Rebekka moves from position to position and eventually dropping from the sky is something you will not forget, even guests feeling as if they are flying themselves. Rebekka also has a trapeze act which is especially interesting for places with lower ceilings and ambient aerial performances. On the trapeze she looks as graceful and strong as always, an Aerial Rope, Silk & Trapeze performer who never fails to blow your mind. ★ Unique choreography for your event and theme. ★ Spectacular and effortless tricks and movements. ★ Mind blowing stage presence that will impress all. Her rope act is just perfect. Thank you so much, the people loved everything she was doing. She is one of those performers who change their personality on stage.